Standing behind the success of just about every nonprofit is a group of volunteers who are passionate and committed to the organization with which they spend their time. In fact, if you develop an amazing volunteer program, you’ll have a waiting list of individuals wanting to work with your acclaimed organization. What is the secret to improving your volunteer recruitment efforts? Mahatma Gandhi once said, “The best way to find yourself is to lose yourself in the service of others.” Guided by the words of Gandhi, I too felt my mark was best left while in service to others. It is the most gracious work one can do. Volunteers are attracted to their work for the value it provides. To create a desired experience for volunteers, there must be a number of positive elements in play. 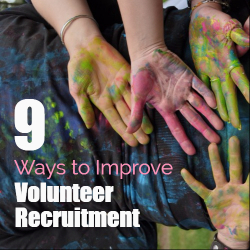 Here are nine tips to improve your recruiting and help you retain volunteers. Volunteers are the best ambassadors for your brand. Give them the tools to promote you well. Your organization needs to clearly define the program and expectations. Volunteers are giving their time, talent and energy to your institution, and they need to know the purpose. You need your volunteer program to be an experience, and a coveted one at that. If they don’t feel productive, they won’t come back. Have a long-term vision for the program, then develop a mission to define the purpose. Most importantly, have well executed policies and procedures. Take advantage of various times of the year when it is more common for volunteers to come aboard. When people come in to help around the holidays, offer incentives for them to stay on year-round. The modern philosophy is experiences over things, and volunteers know this. Create an experience for them that is special. Curate the experience with pleasant work surroundings, competent managers, reasonable schedules, and meaningful work. Clearly outline volunteers’ responsibilities, and keep it consistent and interesting. Recognize their work and remind them of the positive outcome from their help. Did you know that 80% of nonprofits are staffed by volunteers? Everyone can bring something unique to the table. For the sake of you, the employees, and other volunteers, diversify your volunteers. There are many types of people who want to help an organization, and it is best to get a little bit of everything to create the best environment for growth. This is for practical purposes as well. Some younger volunteers may be more willing to work later shifts or lift heavy things. Older volunteers may be more dependable and have more connections for the organization. Depending on your cause, you will attract varying skillsets and individuals. Get a mix of young and old. The younger audiences are great to harness for their social connections. They can help spread the word and involve their friends. Volunteers are not paid in money, but they are paid in experience and connections. They deserve widespread appreciation for their work. Make sure you have at least one person in charge of volunteer experience and appreciation. It needs to be a priority if you want to retain and recruit volunteers. Allow the volunteers to participate in plans for their own events. This shows you trust them, and will increase morale within the volunteer experience. Develop a strategic plan for rewarding volunteers to show recognition. The most common method is the annual volunteer thank you luncheon. Another more frequent option is a volunteer of the month. As volunteers become more comfortable, grant them more responsibility. Acknowledge the increase in responsibility as earned, and thank them for it. Clearly communicate your expectations of volunteers. It is vital to articulate job descriptions for your volunteer positions. There needs to be someone in charge of coordinating volunteers because they have different rights from employees. This person can facilitate questions from volunteers and act as a liaison to others in the organization on the volunteer’s behalf. Make sure the coordinator constantly refines the roster for volunteers, in order to attract the right ambassadors for the brand. Always reiterate the impact of the volunteer’s hard work. Do not just give the volunteers menial tasks. The busy work is okay occasionally, and some individuals prefer this work. The more you invest in them, the more they will invest in the organization. Make their experience a rich one, and give them the space to be creative with the job they do. People value a position more if they feel they authentically contribute in a meaningful way. When you can capture the heart of a volunteer it is invaluable. When you lose the heart of a volunteer you will never recapture it. Support the volunteers to make their experience a social one. Encourage them to bring friends, and get others involved. This is particularly useful for the younger volunteers. They want to help, and if they can enjoy the company of friends, they will be more likely to consider it a social experience. They will sell the message of your organization to their friends if it resonates with them. This is where the investment of educated brand ambassadors is critical because you are recruiting other potential volunteers, too. It is a win-win. Some individuals want to volunteer for the sake of volunteering, while others look to it as an opportunity for growth within the organization. As you see volunteers gaining confidence in their roles, check in with them. See where they are at, and if they want to take on more responsibility. If so, a good method is to enlist them to train new volunteers. You can also schedule outreach events where volunteers can spread the word about your program and organization. Colleges, classes, schools and activist events are great methods for your brand ambassadors, aka volunteers, to share your organization’s message. Give them opportunities to develop special skills so boredom does not occur. Keep in mind, some individuals might have begun as a volunteer with hopes to become an employee. If they do not want a paid position, they just might want more of a leadership role as a volunteer. Communicate with them about their expectations. Partner with other organizations to get the word out. Pair your events with affiliate programs to educate individuals on your mission and recruit future volunteers. Reach out to people when they first move to a community. Welcome them to let them know your organization exists. Make them aware without being pushy. It is best to plant the seed in people’s mind about your organization, then wait for them to come to you. It must be from their own volition; otherwise they will not be as invested. If you have dispersed an in-need message and have a good reputation for volunteers, people will be drawn to you. Long-term volunteers have a huge investment in the organization’s mission. After a great experience as a volunteer, word will spread. Do good and good will come help you. Mary Wong is the president of the Office Depot Foundation, the 501(c)(3) independent charitable giving arm of Office Depot, Inc. To learn more about the Foundation and its new Difference Maker! Movement, visit www.officedepotfoundation.org.